Jeje Lalpekhlua is an Indian professional football player who currently plays for Chennaiyin FC in the Indian Super League and the Indian national team. He was born on 7th January 1991 and hails from the hills in Mizoram, born in Hnahthial in India. He mostly plays as the centre-forward but is also capable of playing from the wings. He is a right-footed player. Living up to his potential, Jeje has grown in maturity and ability both, establishing himself as one of the foremost names in Stephen Constantine’s Indian team. A true goal poacher in every sense, neither is he flashy nor does he possess immense dribbling trickery, but relies on his acute sense of positioning and finishing ability. A hard worker, he is also known for his workrate, covering the pitch up and down helping the defenders and joining in every counter attack. With a stocky frame, he also possesses commendable strength to hold on to the ball. He won the ISL Emerging Player of the Season and the FPAI Football Player of the Year in 2015. Hailing from a footballing family, both his father and brother played for a local club in Mizoram while his uncle represented Mizoram in the Santosh Trophy. Initially he used to play in the defense, as centre-back or a left-back but switched to playing striker after his father encoouraged him to do so. Jeje started out with the Model Sporting Club, the same club his father and brother used to play for. Impressive performances saw him called up to the Mizoram Under-19 squad. Scouted by the Goa scouts, he joined the Red Lizards as a 16 year old. Called up to the Under-19 national setup, he captained the India U-19 team at the South Asian Games. He then joined Pune in 2008. He made his debut for the senior Indian squad on 21st March 2011, against Chinese Taipei in a AFC Challenge Cup qualification match. He put in a fantastic performance, as he scored a goal in his debut match. He even went on to score a brace in his second match for the national side, against Pakistan. He kept up this level of performance, and established himself as a starter for the Indian national football team. Jeje truly found his feet playing for the Chennaiyin FC in the ISL, playing under the guidance of Marco Materazzi. Before the tutelage of World Cup winner Materazzi, there were hints of having something unfinished about him, like an uncut diamond. He was a raw talent, whose best had yet to be drawn out of him. 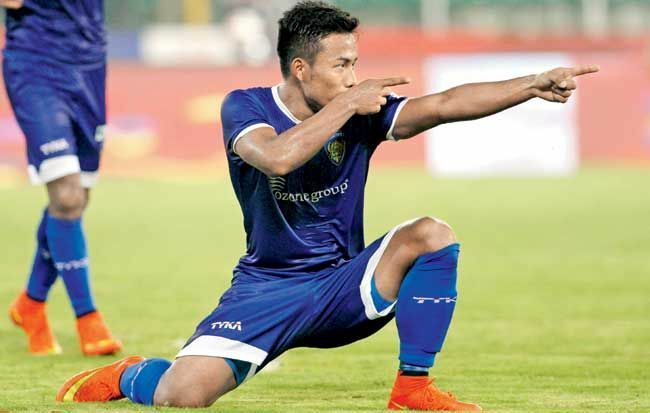 Jeje drastically improved as Materazzi took charge of Chennaiyin, his positioning and finishing got better, while he learned to spray the ball onto the wings in order to create space for himself in the final third. The numbers also started raking up as, Jeje scored 40 of his senior club and country goals after his association with Materazzi. He was the highest scoring Indian in ISL 2015 from open play, with 6 goals and 3 assists. In the 2016 edition he improved his goalscoring record, as he tallied up nine goals and 2 assists. He is mostly known for his performance in the 2015 SAFF Cup where he scored 3 goals including an equaliser in the final against Afghanistan, as India went on to win the match in extra time. Jeje has represented clubs like Pune, Pailan Arrows, Dempo, Mohun Bagan alongside Chennaiyin FC. He has won the ISL with Chennaiyin in 2015, and the SAFF Championship with India the same year.